Cisco introduced the new SFP-25G-SR-S transceiver for Data Center and Enterprise applications. This new transceiver facilitates the migration from 10G to the 25G higher data rate by reducing the dollars per Gbps and enabling the reutilization of fiber infrastructure. 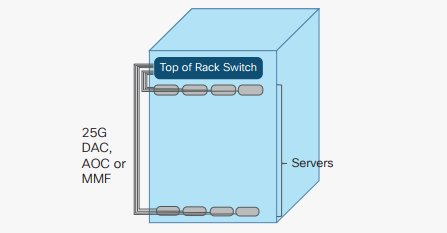 Cisco’s 25G transceivers and cables enable 25 Gigabit Ethernet over a Fiber or Copper Cable for next generation switch and server applications. 25G DAC provide the lowest cost fixed length 1 to 5 meter interconnect in data center “Top of Rack” consolidation applications where high-performance servers are increasing application density on virtualized servers using 25G Sever Adapters driving network capacity demands to levels previously unimagined using Twin-AX passive copper Ethernet technology. 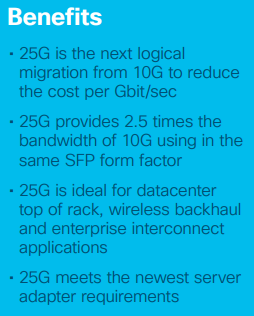 25G AOC provides a cost effect solution for those same data center applications that require longer distance fixed length 1 to 10 meter interconnect using active optical Ethernet technology. 25G-SR-S transceiver are an ideal solution for those same data center applications that require up 100 meters over OM4 fiber or 70 meters over OM3 fiber interconnect using optical (Multi Mode Fiber) MMF Ethernet technology. 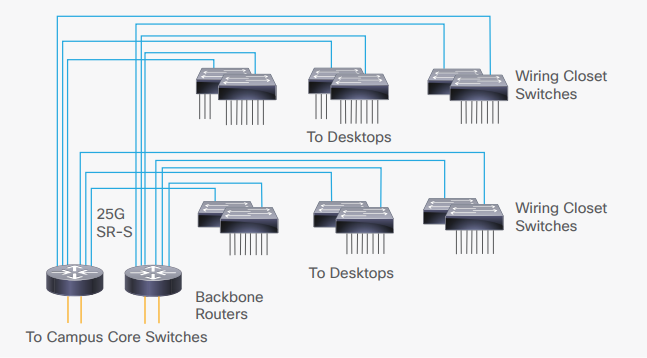 25G-SR-S transceivers can also be used in conjunction with 100G-SR4-S break-out configurations. Additional 25G-SR-S also provides an ideal solution for many enterprise campus backbones where the distances are less than 100 meters for OM4 fiber or 70 meters for OM3 fiber. The following Table shows the complete set of 25G transceiver PIDs currently available from Cisco.